Christmas 1973 and the British press were fussing over just one issue of the day: Would Slade's tub-thumping anthem "Merry Xmas Everybody" manage to kick glam rock rivals Wizzard in the chestnuts and steal the No. 1 position in the Christmas Top 40 music charts. Since then, the battle for and subsequent winner of this festive musical contest has become something of a cultural touchstone for the nation, an indicator of the populist mood and tastes of the day. With past winners including such iconic artists and memorable compositions as Elvis Presley with "Return to Sender," The Beatles with "Hello, Goodbye," Queen's "Bohemian Rhapsody" and, of course, Band Aid's "Do They Know It's Christmas Time?" it's one of the few awards whose significance has endured. 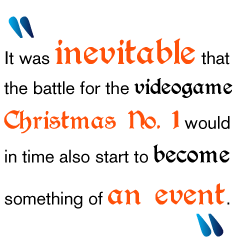 With the increasing cultural presence and astronomical sales of videogames (inverse to that of the mainstream music charts), it was inevitable that the battle for the videogame Christmas No. 1 would in time also start to become something of an event. Similarly the winner of this accolade represents the mainstream consumer's prevailing taste in videogames - or, at very least, the effectiveness of a publisher's marketing budget. Publishers have always timed their releases to maximize the Christmas boon in sales, but the winner of the Christmas No. 1 has now come to represent the season's defining videogame. But, as Dorian Block, Director of Chart Track, the independent company that officially monitors and compiles all videogame sales data across the U.K., explains, the videogame Christmas No. 1 is far from a recent invention: "The first ever videogame Christmas number was, technically, 'Commando' published by Elite on the Spectrum and Commodore 64, in 1985. This was the first year that a videogame chart was ever compiled by a company called Gallup. Chart Track was formed in March 1996 after a management buy-out from Gallup. The current Chart Track directors all worked at Gallup and have decades of experience in the music, video and games markets, in terms of retail tracking." Today, videogame charts are compiled in the same way in the both the U.S. and U.K. "We receive electronic point of sale (EPoS) data on a daily basis from over 7,000 retail outlets (such as Game, Gamestation, HMV, Woolworths, PC World, Amazon, Play and many others)," says Bloch. "Chart Track's coverage is around 90 percent of the entire market in the U.K. This information is loaded into our Oracle database and rigorously checked, matched against our product master database. New products are identified with title/publisher/developer/age rating/genre and added to our database, in readiness for the new weekly chart, which is produced every Monday based on the previous week Sunday-Saturday period. Independent outlet sales are also taken into consideration, and any independent retailer with an EPoS system is welcome to join the panel, and in return they gain access to certain reports on the videogames market." It would be easy to dismiss the videogame Christmas No. 1 as the choice of the lowest common denominator, a game propelled to stardom thanks to uneducated parents buying for children swayed by whichever publisher with the most money. Indeed, past winners give some weight to this viewpoint: Activison won the title in 2007 with Call of Duty 4 while publishing behemoth Electronic Arts took home the accolade four years on the trot before that (FIFA Soccer 2007 in 2006, Need For Speed Most Wanted in 2005, Need For Speed Underground 2 in 2004 and Medal of Honor: Rising Sun in 2003). But is there any science behind winning the accolade? "If I had that answer, I'd keep it to myself or sell the formula to publishers for a huge amount of money!" Bloch laughs. "In 2006 the eventual Christmas No. 1 (FIFA 07) had been out for 12 weeks by the time the Christmas chart rolled around. If there was an average for when it's best to release your game if you're gunning for the top slot, I'd have to say anywhere between two and six weeks prior to the Christmas week - from around the second week of November onwards. Having a recognized brand is key, and it helps if your game has garnered rave reviews. Lots of gift purchasing occurs in the weeks prior to Christmas and that ... familiar franchises always do well. Most winners follow that rule. While EA has won the title in the past four years, Take 2 took the title in 2002 with Grand Theft Auto: San Andreas. That game still holds the record for highest sales in the Christmas chart week, on around 170,000 copies."